Ultrasonic flow meters are sensors with electrical transmission output. Models are compact and lightweight. 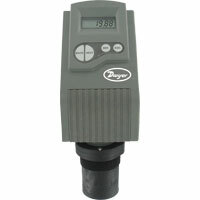 The meters are easy to operate and are ideal for any flow measurement situation. There are options of clamp on flowmeters for the ideal use of clean liquids containing no air bubbles such as pure water. Ultrasonic Flow Converter is paired with detectors to utilize transit-time measuring method. Compact and lightweight. Applicable to short batch processes. 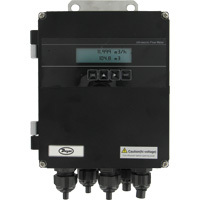 Ultrasonic Flowmeter Converter is paired with a sensor in order to utilize the transit-time measure method. Can easily be configured from the front keypad to specific applications. Ultrasonic Flow Transmitter is an ultrasonic continuous flow measurement that is maintenance free and non-contact measurement of open channels. Ideal for any flow measurement situation. 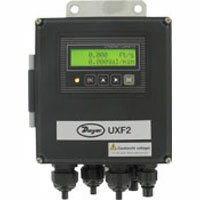 We have purchased a UXF2 Flowmeter. Is there a way to connect the flowmeter to a laptop and run a program to collect data in a spreadsheet? If so, would you be able to provide the required information and program/software. To communicate to a laptop with the series UXF2, you would need a model that comes with either RS-232C or RS-485 serial communication. Further instructions regarding the serial communication can be found in the manual starting on page 85. The full service manual can be found on this web page under Literature.